The transformation of supply chain management is happening now. 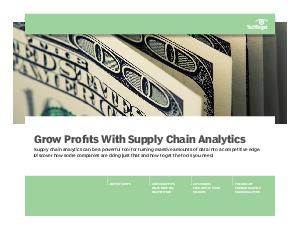 IoT is driving that change, but supply chain analytics is instrumental in taming the massive amounts of data generated by IoT sensors, devices and objects and turning it into insight -- and into a competitive edge. Smart companies recognize this. Take The Bouqs Company, a flower retailer delivering straight from farms. The company has created a supply-driven, farm-to-table, eco-friendly model literally built on the capabilities of supply chain analytics. This includes reducing the typical waste of the flower industry by only cutting flowers when a customer places an order.